What is the secret of a successful business? This is the age of tremendous competition. The business that rises above the competition is the one that does well. This is an online age where every business is trying its best to overcome all the odds and competition and emerge successful. In every business, the customer is the king. There was a time when the customers did not have many options with them. This is not the case today. The customer has a plethora of options. Hence, the key is to satisfy the customer and ensure that he patronizes your business. Holding on to a loyal customer is one aspect of success. The other important aspect is to find new customers as well. In this online age, every business should have a great website to attract the customer. In order to do so, you need to have a high ranking on the SERPs. A first page ranking of the search engines like Google is what you should be aiming for. You need a great SEO campaign to ensure this achievement. Statistics show that more than 75% of people search for local businesses online. An overwhelming majority of these searches are done by people using their mobiles. Secondly, it is also seen that at least 50% of all local searches either end with a phone call inquiry or a visit to the business establishment website. A great enterprise SEO campaign can help tap this potential and ensure the success of the business. 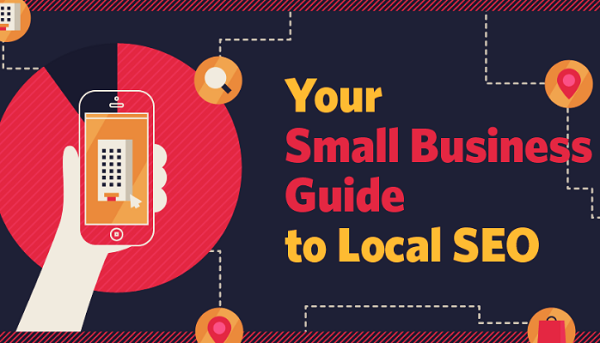 We share 20 simple but essential tips for a great local SEO strategy. This could help you overcome all competition and emerge as a leader in the SERPs. You can classify them as both off-page and on-page SEO tactics. A combination of both these tactics can get you the business you are looking for. This is the mobile age. Where do you think the young customer of today will search for the best grocery store in his locality? Naturally, he will resort to Google. This is what he finds on the SERP when he types out his search, ‘best grocery store in Oklahoma’. 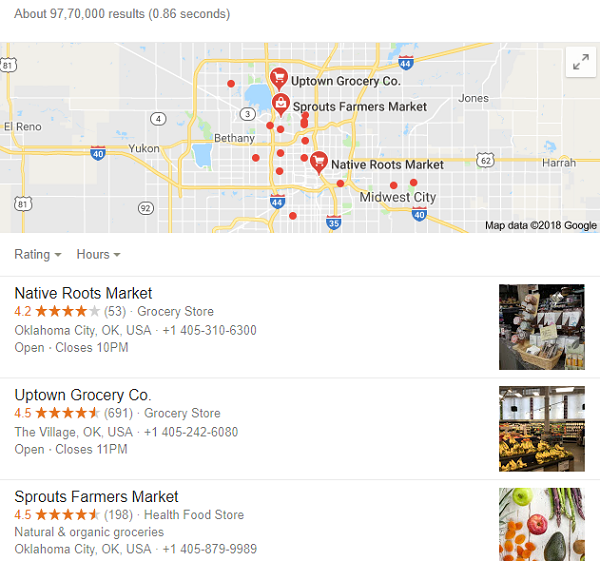 This is nothing but the Google My Business (GMB) listing of the best grocery shops in Oklahoma. Is it that difficult to get a GMB listing? In fact, it is quite a simple job. Access the official website of Google My Business and fill out the details asked for. Google does a simple verification check and ensures that you get the listing as soon as possible. Subsequently, you can add a lot of information like your website address, images, and directions to get to your business, working hours, and various other vital information. This is one of the easiest ways to attract traffic towards your website and business. The customer of today is more comfortable checking out various businesses online. Hence, it is imperative for you to have a presence in all local directories. The key is to announce your presence to your customer and help him find you. Having a presence in a couple of allied category directories is also helpful. You can take the example of plumbers having a listing in the hardware shop directories. This is because people searching for hardware items might require plumbers to do the job for them. This is an online world. You will have to list your business name and address in various directories. You should ensure to maintain consistency in your listings. It should not happen that you use variants of your business name or address in different directories. It can be a trivial error for you, but the search engine bots are not as intelligent as you are. They construe the businesses as different ones and accordingly direct website traffic towards them. Hence, you lose a major share of the business. You can avail the services of TribeLocal’s citations links to ensure accuracy and consistency in your listing. How do you think your teenage son decide which restaurant to go for dinner? He does a quick search on his mobile and goes through the customer reviews of the locally available restaurants. The one with the best rating gets his nod. If this is how you son searches for restaurants every youngster would be doing the same. Hence, it pays to have a lot of positive customer reviews on your website. It is imperative on your part to render good service. Then, it does not become awkward for you to seek positive reviews. Customer reviews play a great role in the success of any business. One has to agree that there is tremendous competition in business today. It can be practically impossible for a small business to reach the top of the global SEO rankings. However, when it comes to local SEO the field narrows down considerably. This enables you to steal a march over your immediate competitors. One way of ensuring the same is to be different from your peers. Your business should offer the something extra that others do not. It could be as small as a CTA option as well. However, the key to having a successful local SEO strategy is to be different from the others. If I tell you that there are more social media accounts than there are people in the world, what would be your reaction? You might not believe it, but it is true. This entails that a lot of people in the world have multiple social media accounts. Hence, this is one of the best ways to improve your clientele. Interacting on the social media is one great way of promoting your business. You get a tremendous reach thereby ensuring that your website gets adequate traffic. This can help you in your local SEO campaigning. You have the GMB listing to announce your presence. Social media is a great tool as well. However, nothing can beat the local promotional campaigns. This is still one of the time-tested ways to attract local customers. Make your presence felt in the local market. Participate in community events in your locality. Engage in some social work in your area. This can increase your presence in the local area. This is a sort of great local promotion. This can help you ace the local SEO rankings and thereby become successful in business. Imagine yourself to be in the customer’s shoes. How would you go about searching for local business? You would type out certain words on the search engine bar. These are nothing but keywords. When you start imagining as a customer in search of your business, you will look at the scenario from a different perspective. 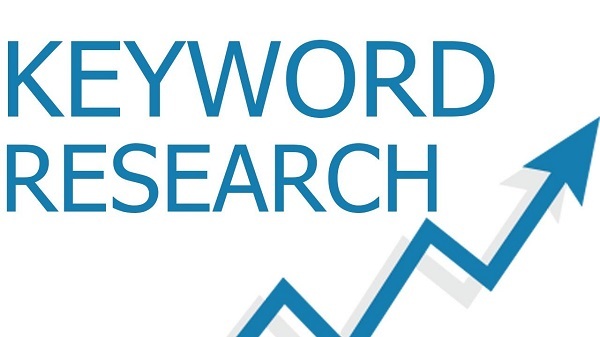 This will help you search for the most appropriate keywords and use them in your content. The search engine bots thus catches these keywords and directs customers to your website. Keywords can be of two different types depending on the intent. One is the business intent and the other is the research intent. You should be having two different sets of keywords for each of the intents. Your content should have a sprinkling of both of them. This enables the search engine bots to locate your website easily. 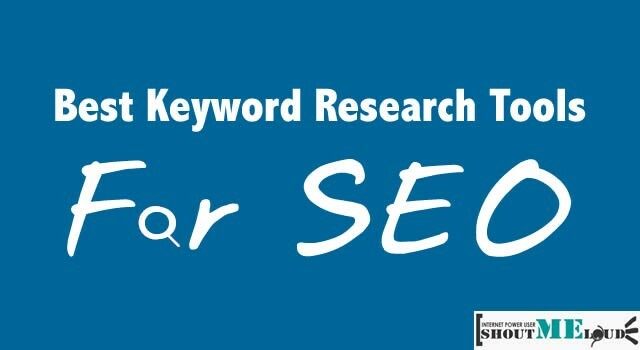 This entails you to optimize the keywords in such a way that the blend seamlessly with the content. There are various tools to help you in this regard. Invest in a great title and Meta description tag. This is a time-tested local SEO strategy. The title and Meta descriptions are the first thing your prospective customer sees when he searches for your website on the search engines. They should be compelling enough to force him to enter your website and probe further. It is better to use your optimized keywords in the title and Meta descriptions to enable your customer to get a better idea of the services you offer. A business without a website is akin to no business at all in today’s scenario. This is the primary requirement for any business to succeed in their local SEO campaign. A compelling website is of utmost importance in order to attract and hold the attention of the customer. It should have all the ingredients one expects a website to have. The About us pages and Contact us pages are important in their own way. Similarly, the landing page or the home page should be as perfect as possible. The customer should get every possible bit of information about the products and services from your website. No one likes to waste time waiting for websites to load. People do not have the patience. Hence, investing in a strong domain ensures that your pages load faster. In addition, the website attains credibility because of the inherent strength of the domain. You should always try to list out your website in a local domain like .co.us instead of trying for a global domain like .com. Your business is as good as your website. 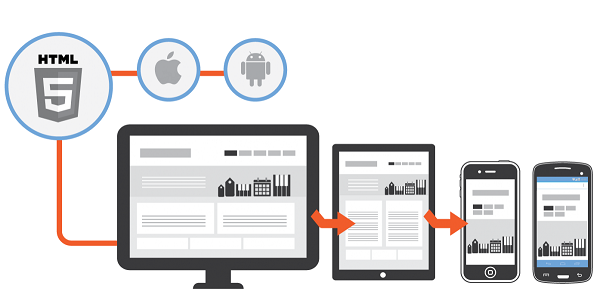 In turn, your website is as good as your content. Invest in quality content. Ensure that the content is free from plagiarism and has a terrific impact on the customer. The customer should get the feeling that he is learning something from your website. Presenting genuine information is always beneficial. The customer always has the facility to check the authenticity of the content. In case, he does not find it authentic, it can affect your rankings a great deal. Allow the customer to express his views. It can be of great help to you to improve the performance of your website. An interactive blog is one of the best ways to be in touch with your customer. You will be able to satisfy his doubts. An interactive blog works in many ways because it allows your other customers to interact and solve mutual problems. An interactive blog is one of the best ways to share information with your customers. One of the greatest secrets of success in any SEO campaign is the effective use of internal and external links. You should just go through any Wikipedia page to understand the importance of internal and external links. In your case, you can use the internal links to connect from your FAQ page to the various services pages. Similarly, the external links can help you to authenticate your content. This enables you to win over the trust of your customers thereby leading to a better rank on the local SERPs. Seeking quality backlinks from authority websites is one of the easiest ways to attain success in your local SEO strategy. There was a time when you could buy backlinks from the market. Now, it is not possible because the search engines have become very strict in this regard. 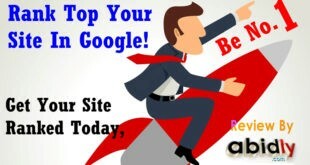 Hence, the only way to gain quality backlinks is to seek them from authority websites like the .gov and .edu sites. You can also take the services of a local influencer to seek quality backlinks. The search engines have become very particular about the strategies you use to secure backlinks. Google and other search engines frown upon the illegal methods people used in the past to secure high rank on the local SEO. They have come down very heavily by imposing stringent penalties on websites adopting illegal methods also known as Black Hat SEO tactics. Hence, the key to success is to refrain from using such underhand dealings to get to the top. This is the age of the mobile internet. We had already seen that more than 75% of people use mobile phones to search for local businesses on the internet. Hence, it makes sense to have a great website exclusively for mobiles. In addition, you can also develop a mobile application that can be extremely useful to your customers. If you carefully see the first page of the Google search engines you will find websites having the words AD written beside it in a small textbox. Do you know what it conveys? This is a simple example of PPC advertising. You pay a certain website to place your ads on the search engine. As people click on your ads you pay the revenue for the business generated. The advantage of using this method is that these websites get preference over the organic websites. The same is the case with Google Adwords. These are simple extraneous ways of popularizing your website and ensuring that they rank on the top of the SERPs. Finally, do not forget to render great customer service when the customer does find your website and decides to patronize your services. One satisfied customer is worth a hundred advertising campaigns. You get a brand ambassador for your business free of cost. All he needs is prompt and efficient service. This is ample proof that the customer is still the KING today. You have seen 20 simple local SEO tips that can help you propel your website to the top of the SERPs. You must have noticed that these tips are a combination of off-page and on-page SEO tactics. Using them wisely can help you secure a top rank on the SERP. This is the key to success in business today. 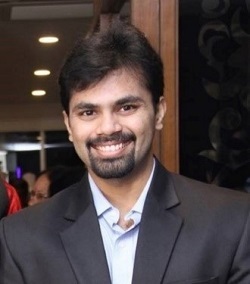 Shishir is an ex-startup entrepreneur currently working on kickstarting inbound marketing for a Silicon Valley startup. Cracked the code of generating 750K monthly traffic in 10 months by using creative content. The first 3 of this list are actually a great combination of a business having a strong online presence. After that keyword searches, customer reviews and good content will take a local business to a next level.